A brand new local food festival launches tonight in the heart of historic Homestead. 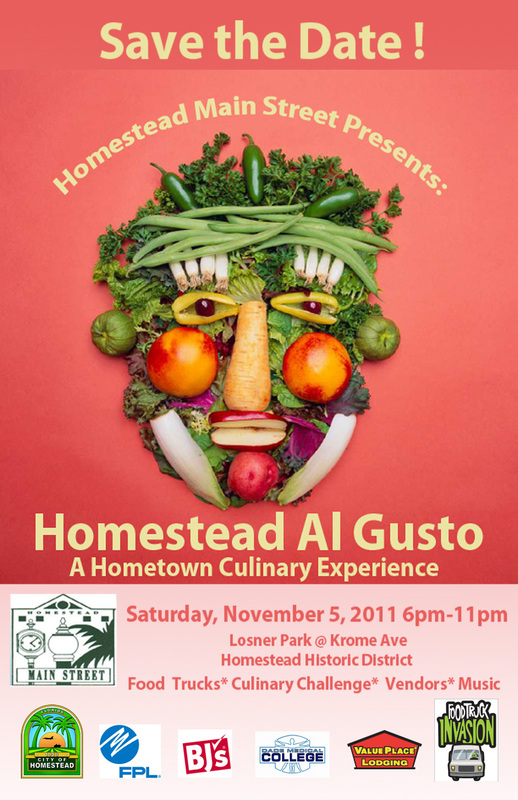 Called Homestead Al Gusto, the event is the brainchild of Adri Garcia, executive chef of Greenrocks Foods. She brings together a number of different elements of the local food scene to this free, family friendly fest. Participating at the event: the Food Truck Invasion, local farmers and food artisans, a Children’s Corner presented by Atala Montessori School with lots of fun kid’s activities, live music, and a Chef’s tent where Chef Adri Garcia and friends will give cooking demos. To add to the excitement, chefs from the Food Truck Invasion will compete for best in show in a Chef’s Challenge issued by local farmers in Homestead. (And farmers are a tough crowd to please!) The chefs will pick up a basket of local produce containing in season vegetables and herbs from Redland, and make a dish using their particular style of cooking. The results will be judged and a prize will be awarded. We’ll be there with our heirloom tomato seedlings, avocados, honey, herbs, luffas and other goodies. Come visit and join the fun!